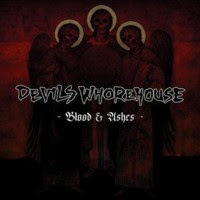 Hall of the Mountain King: Review: Devil's Whorehouse, "Blood & Ashes"
If imitation is truly the sincerest form of flattery, then Glenn Danzig has to feel pretty good about this project from Morgan of Marduk and a few unknown guys. The band began in 2000 as a Misfits/Samhain cover act and has apparently released a handful of records and EPs over the years, which I somehow missed. Basically, they’re still playing Misfits/Samhain covers. The 11 tracks on this album pretty much run the gamut from the energetic punk of the Misfits to the more bluesy sounds of Danzig and all points in between. That doesn’t mean it’s bad. In fact, there are quite a few entertaining numbers here for fans of the various incarnations of Danzig, but don’t go into this looking for something original. Ultimately, Blood & Ashes is what it is — a group of guys who love the Misfits, Samhain and Danzig paying tribute to those bands. They do it well. Maelstrom has a passable Danzig impression, though at times it falters, and the rest of the band provides chops that wouldn’t be out of place on record by the aforementioned bands. It’s low on originality, high on energy and probably worth a listen for fans of the various faces of Danzig.